The only one in Valencia with AIR-CONDITIONING in room. The only one in Valencia with HOSTEL-BAR to meet other travellers like you. This is the new baby born from Nest Hostels. If you liked the Red Nest Hostel, the Purple Nest Hostel will drive you crazy. Located in the heart of Valencia city centre area, in an important street near the river Turia(the biggest park in town). Just a few minutes walk from the city´s most interesting cultural and architectural sights (Cathedral, Basilic, Plaza de la Reina, City Council Square, Barrio del Carmen...), well connected to the beach, the train station, the old city, the City of Arts and Sciencies and the best places to go out, from traditional 'tapas' bars to the hippest nightlife. We are in the middle of a characteristic area of the town, between the commercial area and the bohemian el Carmen district. The Purple Nest is the best place for backpackers to enjoy Valencia this summer. Don't worry about the heat!! We are very close to different(indoor) swimming pools in the city and just a few meters away from the bus stop to the beach, and in our hostel you won't suffer the high temperatures, thanks to our air conditioning system, which make us the most refreshing hostel in Valencia this summer!! 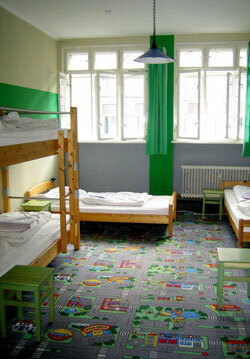 Vienna City Hostel offers cheap accommodation in dormitories, free breakfast. All rooms with shower and toilet. No curfew. Online booking. The backpackers first choice. Central located.